Ready for some yummy, unusual cookies? I've always been attracted to delicate little tuile cookies and florentine cookies. 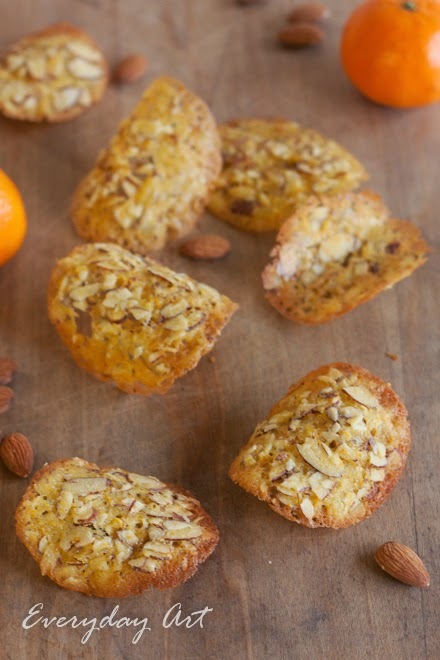 They are so delicate and light yet full of flavor--chewy and crunchy all at once. A few years ago I made some chocolate-cinnamon tuiles that were great, but I haven't tried any since then. 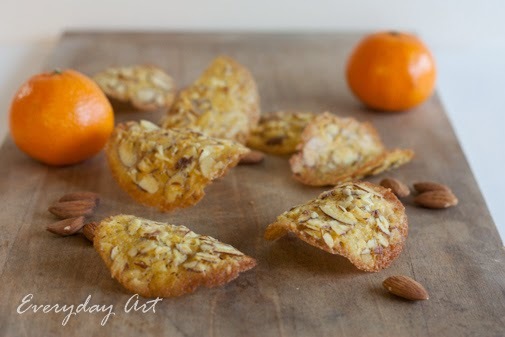 Until these wonderful Orange Almond Tuiles. I found the base recipe from Cookies Unlimited by Nick Malgieri and tweeked it a bit. It was such a fun cookbook! I checked it out from our local library and tried a few different recipes throughout the month of December and had quite a fun time doing it. I think you should try them. I feel quite confident that you won't be disappointed! Combine the orange zest with the egg and sugar in a medium bowl. 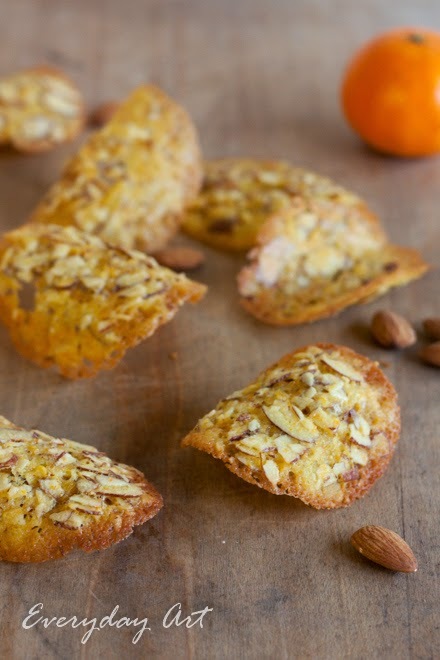 Use a small rubber spatula to stir in the almonds, then the flour. Fold tin the butter, then the extract. If you intend to leave the cookies flat, tear off some sheets of wax paper or fil so you can stack the cookies on the pan. Don’t put them on a rack to cool (they are too fragile). Drop the batter by teaspoonfuls onto the prepared pans, about 6 per pan (leave at least 3 inches between them. 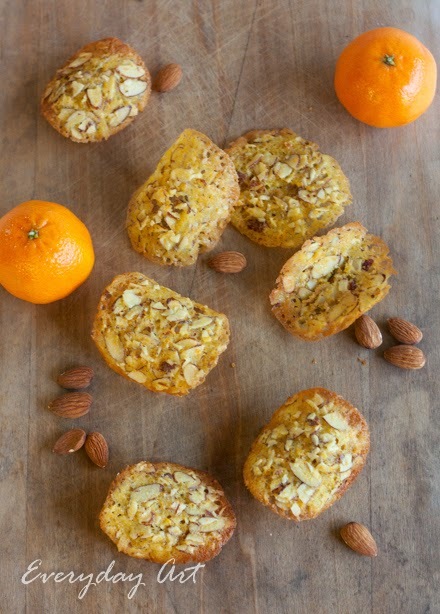 Use a fork or a spatula to flatten each mound of batter to evenly distribute the almonds before baking. Place a single pan of cookies in the oven and bake for 5 to 7 minutes, until they start to bubble on the pan, spread and become thin, and take on a deep golden color. Remove the pan from the oven and immediately replace with another prepared pan. Let the cookies you just removed firm up for a few seconds, then slide the spatula under each one and detach it. Move quick. Either place on the rolling pin to curve or put them on one of the cooling pans. If the cookies become too cold and you can’t remove them from the pan without shattering them, replace the pan in the oven for a few seconds to soften the cookies again. Contain until all the cookies are baked. Store the flat cookies between sheets of parchment or wax paper in a tin or plastic container with a tight-fitting cover. It isn’t recommended to store curved ones more than a few hours before serving—they are so fragile they would turn into a tin of very delicious crumbs.